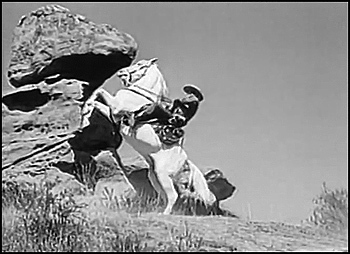 Anyone familiar with "The Lone Ranger" remembers its classic opening credits, as the masked hero sped along on his white horse 'Silver', through rugged Western territory, firing his six-shooter. Then, with a his hearty cry of "Hi, ho, Silver! ', his steed reared up on its hind legs, next to a uniquely-shaped rock. So, you may ask, where was that "Lone Ranger" rock? Is it still around to be found after all these years? The answer is yes, it is. You'll find it still standing out in Chatsworth, in northwest corner of the San Fernando Valley. It can be seen from traffic on the east side of Redmesa Road, just north of Santa Susana Road (only a few miles from the Woodlawn cemetery, where Fred Astaire & Ginger Rogers are buried). From that cemetery, head back east to Topanga Canyon Blvd, then take Topanga Canyon a mile and a half north to Santa Susana Road and make a left. Follow Santa Susana west about a third of a mile to Redmesa Road and turn right (north). About halfway up the hill (after you drive only about 250 yards up Redmesa), the rock will be visible (through the trees and bushes along the side of the road) on your right (east) side. Or, from the Ronald Reagan (118) Freeway, take the Topanga Canyon Blvd offramp and go about a third of a mile south to Santa Susana. 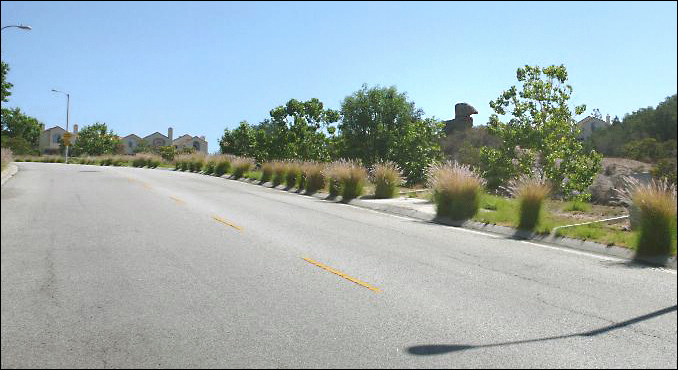 Make a right and go west on Santa Susana to Redmesa Road, then turn right. Here is a map, with the locations marked. The once wild area is slowly building in with condos. so it may not be there forever. Here are some photos of the rock, courtesy of Rich Barnes. Click on them to see larger versions. Close look at the Lone Ranger rock. If the scenery in some of those old TV Westerns such as "THE RIFLEMAN" and "HAVE GUN WILL TRAVEL" looks alike to you, that may be because many of them were shot in the same place: a mock western town inside the Paramount Ranch (at 1813 Cornell Road, Agoura). 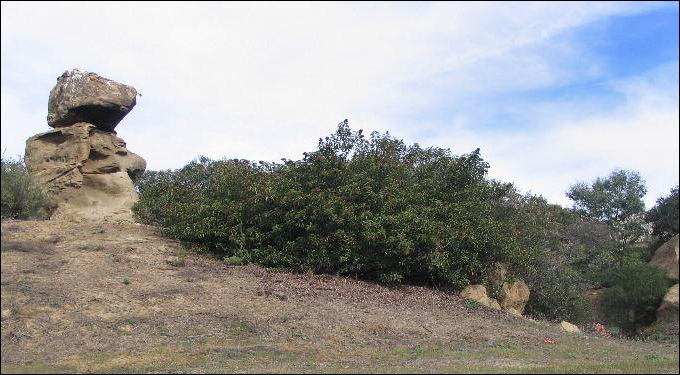 It's now a part of the Malibu Creek State Park, and is open to the public. Recently, they filmed the TV series "DR. QUINN, MEDICINE WOMAN" at the ranch. You can visit the ranch each March during the annual Cowboy Poetry and Music Festival. Remember Ozzie & Harriet and Ricky Nelson? Well, in their old TV sitcom, the Nelsons lived at the fictitious address of the 822 Sycamore Road. But in real life, you can find that family home from "THE ADVENTURES OF OZZIE & HARRIET SHOW" at 1822 Camino Palmero Drive, in Hollywood. It was the Nelson's family's actual home. That short, hilly street is located above Hollywood Boulevard, half a mile east of Grauman's Chinese Theatre. The Los Angeles City Hall (at 200 N. Spring Street) in downtown L.A. looks familiar to just about everyone. In the old "SUPERMAN" TV series (starring George Reeves), it was the "Daily Planet" building (the newsroom was supposed to be on the 18th floor). If you remember "The Andy Griffith Show", you'll remember the catchy tune song that was whistled during the opening credits of that rustic hit show, while Andy & Opie strolled past their idyllic fishin' hole, and young Opie tossed a stone into the lake. But don't go looking for it in North Carolina. This classic scene was actually shot right here in Southern California, at the upper lake of Franklin Canyon Park. That's located up in the hills between Beverly Hills and the Valley. The official address is 2600 Franklin Canyon Dr, in Beverly Hills, CA. This is a big park, almost 3 miles long, and there is a lake at each end. That's right, two lakes. The lake you want, from the show, is on the north side of the park, and it's officially called the Upper Franklin Canyon reservoir. Here is a Google StreetView of the lake. Well, Dino's Lodge is gone, but the real address of the old Lodge was 8524 Sunset Boulevard - right on the Strip. Dino's Lodge disappeared back in the '70s. But the remodeled building continued as home to the Tiffany Theatre. and she cruised to the hamburger stand, now. like she told her Old Man, now. she goes cruising just as fast as she can, now. This Foster's Freeze is located at 11969 Hawthorne Blvd. (between 199th and 120th Streets), in Hawthorne. It's on the west side of that street, just across from the old Hawthorne Plaza Mall. The Beach Boys lived on 119th street, just a mile east of this stand, which is still open for business. While in the Hawthorne area, you can also see a Beach Boys monument that was erected nearby, on the former site of the Wilson's family home, where the Beach Boys wrote and recorded many of their hit songs.